I probably wouldn't have thought of visiting Sunset Nurseries with my friend and her boys if we hadn't seen the sign advertising the sand sculptures. The sand sculptor's name is Simon, and I used to walk past one of his sand sculptures nearly every day until the area was cleared for building. I had wondered where Simon was working now. So when I saw the sign saying they had moved to Sunset Nurseries, I decided to go and see. Set in the beautiful parish of St Ouen, the nursery grows cut flowers for the local florists and for export. The main flower they grow are Alstroemerias - Peruvian Lillies - which come in a wide range of colours, and are popular with the florists as they last well. 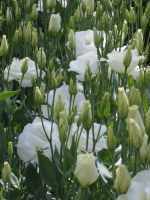 They also grow Lisianthus, sometimes known as Eustoma or Prairie Gentian. These gorgeous flowers bloom from July until October and are sold locally as cut flowers, often used in wedding bouquets. Ranunculus are grown which flower in March and April. 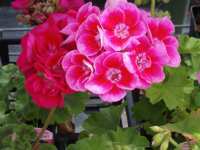 They are like large double buttercups in a variety of bright colours. Some carnations are grown here as well. My Mum, who is a keen flower arranger, says that their carnations are much better than the imported ones because they are so fresh and they last much better. Sunset Nursery is a family business - although they haven't always been flower growers. Because the greenhouses are open to the public, they prefer to use biological pest controls, and focus on cut flower crops which require little of no heat, making them environmentally friendly growers. You can go into the production glasshouses and see the flowers being picked. They grow all year round, so there's always something to see - although the café and tea garden shuts in the winter months. 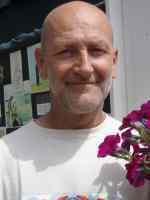 You can buy cut flowers at Sunset nurseries, and you can order flowers to be sent by post. Because so many visitors have asked where they can buy plants to take home, Sunset have recently started selling plants too. A thoughtful touch is that most of the plants they sell are small, to make them easier to carry. You can take plants back to the UK without any restrictions. 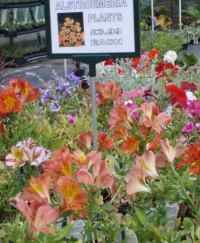 As you would expect, they had Alstroemeria plants for sale -but also a range of speciality geraniums. I took a photo of one of my favorites! 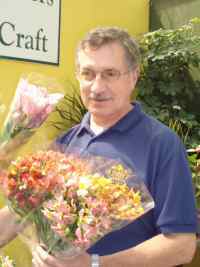 They also sell the flowers that visitors often ask about - Lampranthus (Ice plant), Agapanthus (Lilly of the Nile), and Jersey Lilly bulbs. We had a quick look round the gift shop, but the boys were keener to try out the cakes and milkshakes in the tea rooms. The menu there includes Jersey cream teas, various home-made cakes, jacket potatoes and home-made soup. I was pleased to see a well-stocked play area for younger children. My son is grown up now, but I remember what a delight it was when he was younger to find somewhere I could sit and have a cup of tea and a chat while he played happily. Refreshments over, we headed over to the indoor sand sculpture display. 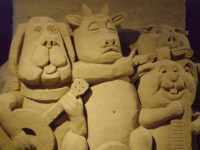 Simon Smith has been sand sculpting for ten years, having accidentally discovered his talent on the beach one day while recovering from a serious illness. 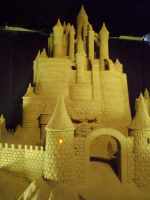 He has worked all over the world creating sand sculptures, and won the world masters sand sculpting contest in 2003. The sculptures here were created by Simon working with a team of other sculptors, and used 300 tonnes of sand. The amazing thing is that they are made with just sand and water - Simon told us that the trick is using builder's sand and lots of water. The sand sculptures don't have a particular theme. They include castles, superheroes and story book characters. Each winter Simon and his daughter work together to change part of the display. 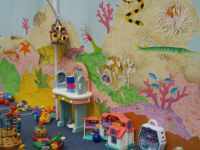 Unlike Sunset Nursery which is free to enter, there is a charge to view the sand sculptures. We thought it was worth it to see them - they really are impressive.